Robust, versatile, and luminous in the dark: a scorpion has the qualities it needs to thrive in many different environments. The same applies to this Laco model, which is also suitable for a wide range of applications. That's why the watch also features appropriate markings as a special highlight: a relief design in the form of a scorpion. The four timekeepers of the product range share the same black dial with white arabic numerals as well as the shape of their casing. 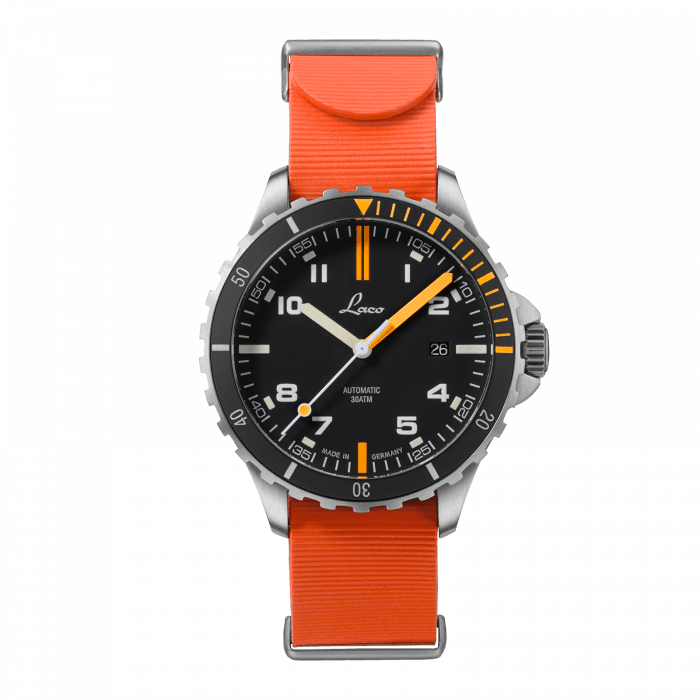 Depending on the model they differ in their visual colour accents, with the black, unidirectional bezel, the indices and the minute hand being coated in luminous Superluminova paint in white, green, blue, or orange. The long-lasting afterglow effect ensures optimal readability in low lighting conditions or even complete darkness. This is another aspect where the scorpion analogy is appropriate: the scorpion produces fluorescent materials that make it visible at night under UV lighting. With its solid exoskeleton, the scorpion is also exceptionally tough and strong for its small size. This is another characteristic that applies to this squad watch. The 42 mm diameter "Scorpion" model also resists external influences. This is assured thanks to the solid stainless steel case, and the fact that both the caseback and the crown are screwed into place. The double domed sapphire crystal is scratch-resistant. Its internal anti-reflective coating means that reflections are reduced, with improved transparency. 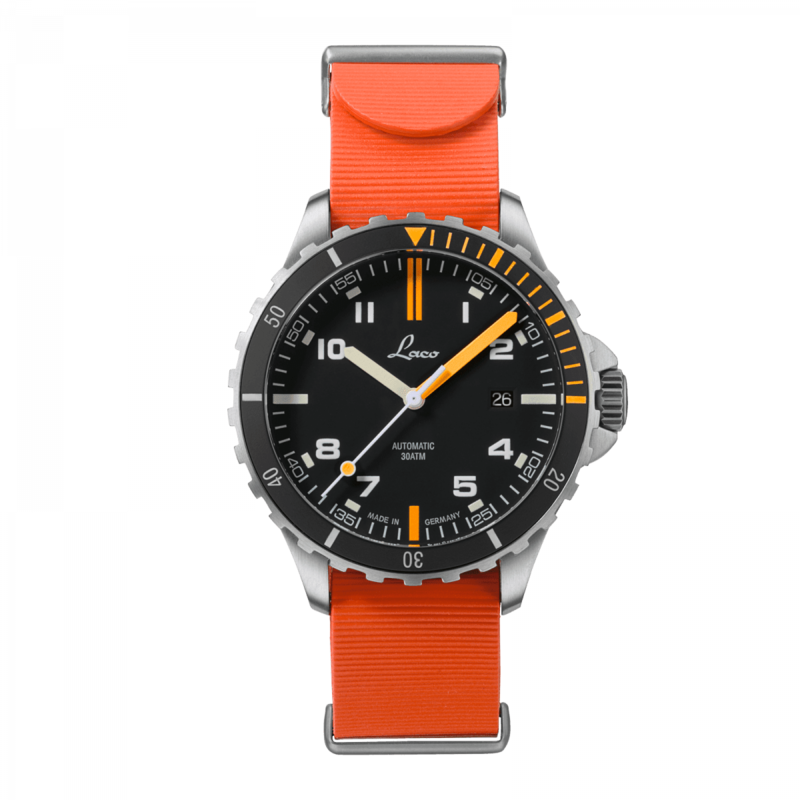 The watch is also waterproof to 30 atmospheres and, to ensure that the watch can be used to the full in the water, different models are available, with a choice of rubber or stainless steel straps. The "Scorpion" combines practical functionality with sophisticated looks. It fulfils its potential in a variety of different settings. From the mountains to the desert or tropical rainforests, this flexible sports watch is ready for daily use in outdoor environments. The names of the four models reflect its purpose, namely Himalaya, Amazonas, Atlantik and Mojave.